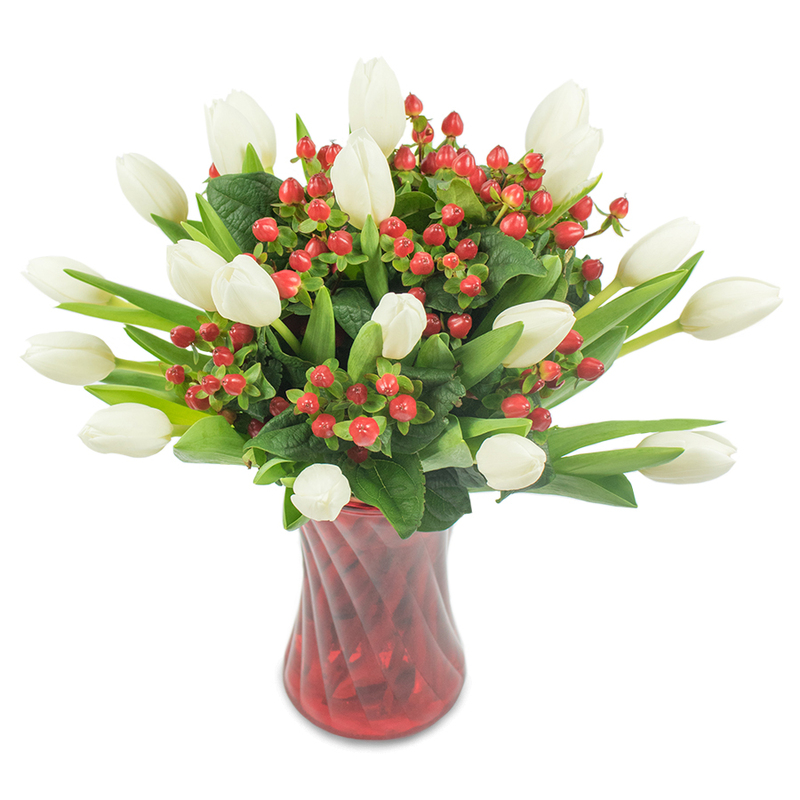 A charming arrangement consisting of delicate white tulips and festive red hypericum. The perfect gift to spoil the special ones in your life. I received a friendly email explaining everything that I wanted to know about the flowers and the delivery. The price was fair and fit my budget. Will definitely use again. My boss liked the bouquet. Thank you for the timely delivery of these gorgeous tulips! Delivered on time to my dear friend in London. She sent me a photo and I must say the bouquet looked very pretty. Responsible company that responded to my inquiry and offered a great variety of arrangements to choose from. Ordered the bouquet for my girlfriend. It was delivered at her work and made her feel very happy. Thanks! Thank you team for the prompt delivery and the trouble-free experience! Chose a very creatively designed bouquet for my wife. 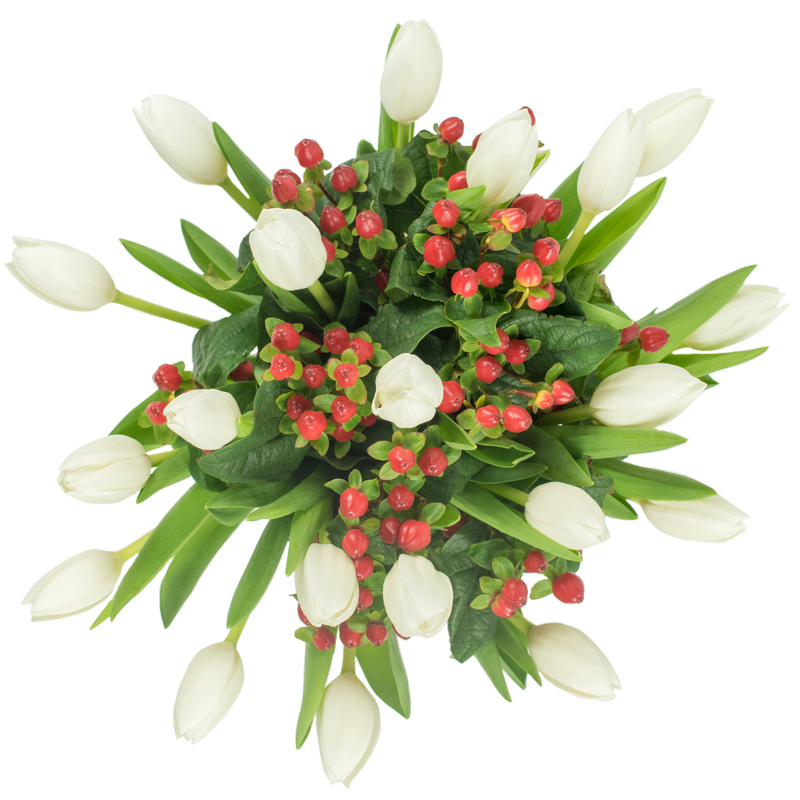 The delivery was superfast and the quality of the flowers was top-notch. I loved the dreamy design of this bouquet, my mother loved it too. Very pleased with the fast and cheap delivery and will recommend to friends and family. I was planning a birthday surprise for my grandma and I ordered a beautiful bouquet from this online shop. She loved it – thanks for helping me surprise her!